The Lunar Reconnaissance Orbiter is a NASA moon mission that has been in operation since 2009. The mission particularly focuses on the moon's poles to search for water or ice that could exist in permanently shadowed craters. Among its results, LRO made several water discoveries of its own and released a highly accurate topographic map of the moon in 2011. The spacecraft even found the remains of several early space program probes that reached the moon in the 1960s and 1970s. NASA launched LRO along with the Lunar Crater Observation and Sensing Satellite (LCROSS), which was also searching for water. The two probes together cost $583 million. In 2009, the agency deliberately smashed LCROSS into the moon. The crash unveiled large tracts of water ice at the lunar south pole, in a crater called Cabeus. After spending the first phase of its mission as a scout for future probes, LRO moved to dedicated science-gathering in September 2010. 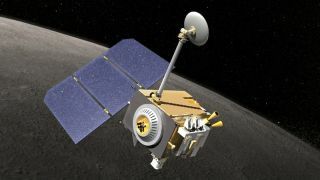 As of its fourth anniversary of operations in July 2013, LRO had sent back 434 terabytes of data — more than the total collected by all other NASA planetary missions together. And it's still prolific today. LRO was created in the mid- to late 2000s, during a time when the United States was targeting the moon as the next likely destination for humans in the solar system. NASA pegged the spacecraft as a "first step in this endeavor," saying the mission would "create the comprehensive atlas of the moon's features and resources necessary to design and build a lunar outpost." While NASA is now pursuing a path to Mars that may not necessarily include a moon landing, LRO was also advertised as a valuable test bed for operating technologies and flight operations beyond Earth. Its instruments included a cosmic ray telescope that would search for radiation and its effects, a radiometer to learn more about what lay beneath the surface and a mapper to examine the entire moon in ultraviolet (particularly highlighting surface ice and frost). LRO also carried a camera and an altimeter. LRO and LCROSS launched from Earth June 18 from Cape Canaveral Air Force Station. After a mid-course correction, the pair reached the moon's orbit June 23. Even early in LRO's mission, scientists saw strong evidence that water or hydrogen is evident on the moon. During the probe's testing and calibration phase, LRO's neutron detector found there was a spike in hydrogen in craters, hinting there could be water in the shadowed regions, as well as other hydrogen not confined to those areas. When LCROSS smashed into the moon, LRO watched the impact from its orbital perch 31 miles (50 km) above the moon's surface. The camera caught a plume of material from the surface that showed a "significant amount" of water at LCROSS's crash site. Later analysis of the crash site revealed it could be wetter than the Sahara desert, suggesting that Cabeus crater could be a spot for a future moon base. Besides water, other possible resources for future moon explorers at that site include ammonia, carbon monoxide, methane, mercury and silver. In 2012, LRO uncovered what could be a large amount of ice in Shackleton Crater, which is almost exactly on the moon's south pole. Scientists were cautious with the finding, however, as the laser used for the instrument also found reflective areas in other, less shadowed parts of the crater. One of LRO's main non-water findings was showing that temperatures on the moon might be more frigid than Pluto. In one spot on Hermite Crater, the temperature was recorded as minus 415 degrees Fahrenheit (minus 248 Celsius). Pluto's temperature is estimated at minus 300 F (minus 184 C). In 2011, LRO completed a topographic map covering more than 98 percent of the moon's surface. "We can now determine slopes of all major geologic terrains on the moon at 100-meter scale, determine how the crust has deformed, better understand impact crater mechanics, investigate the nature of volcanic features and better plan future robotic and human missions to the moon," stated Mark Robinson of Arizona State University, and principal investigator of the Lunar Reconnaissance Orbiter Camera, that year. NASA did a technology demonstration in 2013 where the agency beamed a picture of the Mona Lisa to the moon. Besides the public relations value, the demonstration also was hailed as a move forward in the capabilities of interplanetary spacecraft communication because no laser beam had ever traveled so far before. In the near future, this could back up radio communications, NASA added. The spacecraft also pinpointed several lunar probes that landed or crashed on the moon earlier in space history, which provided the most accurate records of their locations yet, and took pictures of the Apollo moon landing sites. LRO results continue to show extensive history in the ice. In March 2016, partly based on LRO data, research suggested that the moon's spin axis changed, based on how older ice was distributed. Among other observations, scientists saw that the ice at each pole appeared to be displaced by the same distance in opposite directions, implying a different spin axis in the past. The spacecraft also has shown what happened to the moon's volcanoes. In 2014, research released showed that volcanism likely slowed down gradually instead of coming to a direct halt. A wide distribution of young volcanoes was spotted by using the higher resolution of LRO, which showed smaller details of the surface than previous missions. Mapping of the moon has also greatly improved with LRO. In 2014, for example, scientists released a north pole mosaic with a resolution of 6.5 feet per pixel. The map even has consistent lighting to more easily compare different regions. Citizen scientists can even get involved with parsing LRO data using a CosmoQuest.org site called MoonMappers. In 2014, results showed that amateurs working together as crowdsourcers could identify craters on the moon with the same accuracy as experts.